This item is sold per 6.4 oz gift bag. This item is sold per 6.5oz gift bag. NUTRITION FACTS: Serv. Size: About 1 piece (34g). Servings: About 6.5. Amount Per Serving: Calories 170, Fat Cal. 70, Total Fat 8g (12% DV), Sat. Fat 4.5g (23% DV), Trans Fat 0g, Cholest. 5mg (2% DV), Sodium 170mg (7% DV), Total Carb. 22g (7% DV), Dietary Fiber less than 1g (3% DV), Sugars 15g, Protein 3g, Vitamin A (2% DV), Calcium (4% DV), Iron (2% DV). Not a significant source of Vitamin C. Percent Daily Values (DV) are based on a 2,000 calorie diet. At first when I received them I wasn't thrilled! They were very hard and didn't taste that great until the second day when they had a chance to soften up a bit! THEN I couldn't stop eating them, they were delicious! Definitely will buy them again! 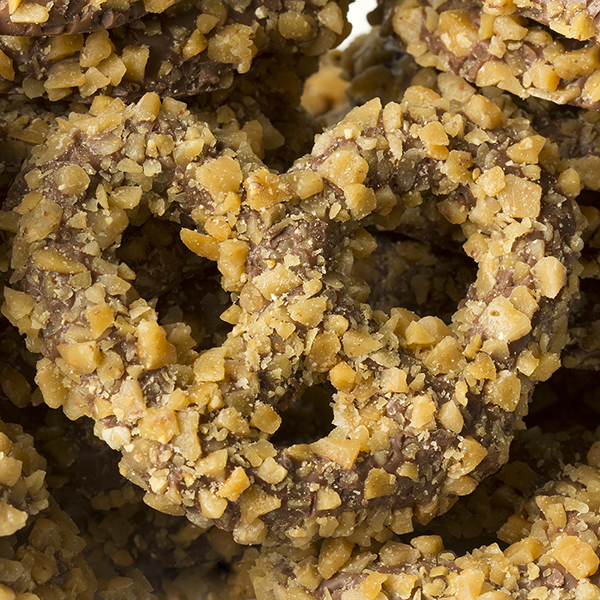 Marvelous, the pretzels softened a bit and with the milk chocolate and toffee, superb! I have spent the majority of my life not caring whether I ever ate a piece of chocolate. Then I discovered this wonderful , heavenly combination of chocolate, nuts and salt. I hoard several packages of these and have, during a generous moment, shared my find with others who have totally agreed with my recommendation. Part of me is reluctant to share my review with others for fear that these will be out of stock when I need to reorder but some things are just too good not to share.